Ekphrastic poetry utilizes the medium of verse to address, to interpret, and to transliterate another art form. Good ekphrastic poetry transcends commentary and criticism, evolving into a singular and separate art form, a kind of aesthetic collaboration—the poet coming to terms with the artistic expression. Emblems of the Passing World is such a collaboration. 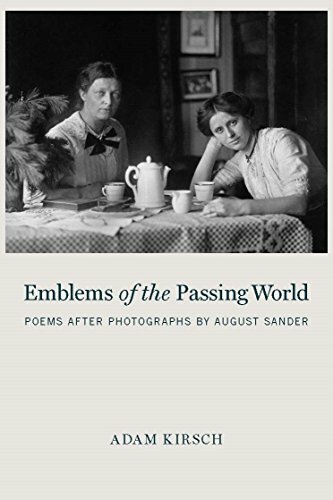 In this volume, Adam Kirsch, who is, in addition to being a celebrated critic and columnist, a critically acclaimed formal poet, has written a series of elegantly ekphrastic formal poems addressing the enigmatic portraiture of the great twentieth century German photographer, August Sander (1876–1964). Sander began creating his impressively formal, unnervingly detached portraits of German people in 1910 for his series, People of the Twentieth Century. Kirsch’s poems focus for the most part on pictures taken by Sander from 1910 through the 1920s. Kirsch writes a compelling introduction to his book of poems, contrasting the snapshot and its fleeting sense of temporality with the composed formality of Sander’s portraits. Sander’s subjects, carefully posed and frequently gazing directly at the camera, are not named, but are referred to as types, “a type that is the product of class, occupation, gender, family role” as Kirsch explains. Kirsch titles each poem with the name of the photograph to which it refers so that the poems, as well as the photographs, echo Sander’s somewhat Platonic naming convention. The overall result is a more or less seamless and formally consistent unity. Kirsch’s metered, rhymed verse and careful diction accurately translate the earnest formality of Sander’s compelling compositions. There is one dramatic difference. Kirsch has the advantage of history. He knows the long-term effects of World War I, the tragedy and transience of the Weimar Republic, and the fact of World War II, material that was not known to Sander at the time he produced the majority of the photographs in this volume. We know the same history Kirsch does, and with him, we study these stoic, sometimes expressionless faces for clues. Kirsch’s poems provide invaluable insights. In the poem, “Butcher’s Apprentice,” for example, Kirsch describes a neatly suited young man in whose “. . . closet hangs an apron flecked/With bits of brain . . . ,” a clue to the violence we overlook, a violence that inures us to the violence yet to come. Kirsch has an unerring ability to spot Sander’s “stigmata” of propriety. A skilled formalist, Kirsch measures out the formlessness of form. In his sonnet, “Middle-class Child,” for example, he writes about a self-confident and privileged little girl in heroic couplets, a disturbingly apt choice, given the subject matter, but, nonetheless, an irregular rhyme scheme for a sonnet. Kirsch further roughs up the formal elements by mixing slant and perfect rhyme. As for the child, “. . . all her life has been arranged to hide/The possibility of nemesis.” In the meantime, Kirsch has incorporated conflict directly into the formal structure of the poem itself. Kirsch’s poems conflate the transitory with a sense of predestination. So much is changing and falling away; so much is falling backwards into history. In “Working-Class Mother,” Sander’s subject stands in a doorway holding her infant son. The child smiles at something “Beyond the frame, forever vanishing,/An emblem of the passing world . . . ,” a world in which there is no permanence, a world of terror, a world of ephemera. In the poem, “Merchant’s Clerk,” Kirsch envisions an even grimmer fate for the clerk who is the subject of this photograph. That fate is World War I, which left its participants “Crippled or mad or dreaming of revenge.” That war—and the next—and the simmering passions and resentments of the Weimar republic in between are implicit in these photographs and in these memorable poems. Throughout this volume one senses an unerring and provocative match between poem and photograph, as well as a natural and revelatory application of poetic form, in that regard, a veritable textbook demonstration of effective poetic closure to each poem. Adam Kirsch has produced in these balanced, unflinching poems a unity of artistic perspective of great value in our troubled times.